When you are thinking about trading in the financial markets, you might consider Forex Trading, which has an advantage over other trading platforms. The main reason for this is that the Forex market operates nearly continuously from Monday through Friday, allowing almost every person, even if they are in another job, to trade in this market as opposed to the stock market, which closes each day at 4 PM Eastern Time. The freedom of Forex trading means that you can trade late at night or early in the morning, depending on your daily schedule. Also unlike the stock market forex trading does not require a stockbroker to place a trade, which has the potential to save you money over time. This will come as a welcome relief to those who are accustomed to the stock market and the fees associated with stockbrokers. In Forex, it’s not necessary that you have a large amount of money in your account, censure trading currency pairs and dealing with Pips, you don’t need to make a larger spend, in order to become profitable. FACT: What is a pip? This is the smallest price change that a given currency pair can move. Since most pairs are priced to four decimals, smallest change is that of the last decimal point, equivalent to 1/100 of 1%. Depending on the platform, getting started is easy and inexpensive, beginning with as little as $300 or even less with some online brokers. However when this $300 is used properly and with forethought, it can be turned into a small fortune. 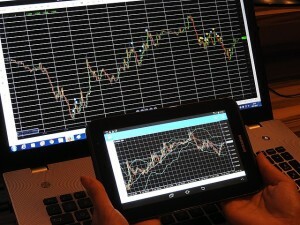 Forex trading can be done from the privacy of your own home, actually from anywhere that you have an internet connection. And while the Forex market is traded by many of the world richest individuals and companies, it is also open to the average person meaning, that while you may not have the cash reserves of the rich, you do have some of the same opportunities. There is nothing stopping you, from beginning your own road to riches, beginning now. All it takes is a bit of education concerning Forex, opening an account (demo), then doing some practice trades into your demo trading account to get familiar with how it works. While the industry is regulated to a degree, it operates with much greater freedom than do the stock exchanges, allowing anyone to enter the market, assuming they have the necessary liquid funds to trade. While there may be times you wish to be inside your Forex trading account early in the morning, or late at night, there are actually no specific hours, and the market trades 24 hours a day and while this is a fast-moving market, it’s not necessary to understand thousands of stocks, since in most instances, Forex is traded among four main currency pairs. This allows a Forex trader, to zero in on exactly where they have the most knowledge, and hopefully where they can profit quickly and often. Always look for long-term trends, and then shift to daily charts, doing so will help you analyze the market trends more efficiently. One of the best ways to trade foreign currencies, is the of the breakout method. While a little bit of study is required to understand the breakout method, once understood and implemented with the correct timing, your profits can be significant. You should time wisely, since all of us no matter how wealthy, are limited to 24 hours in each day. Find a trading system that is time efficient, one that allows you to maximize your resources, both time and money.